Rustam Minnikhanov, the рresident of Russia's Republic of Tatarstan, discusses the challenges, successes and legacy of this summer’s Universiade student Games held in the capital city. 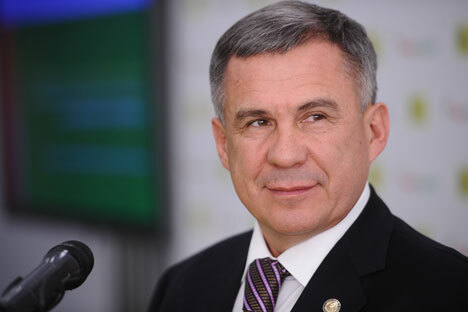 Rustam Minnikhanov, the president of Tatarstan, considers that major sports events contribute to the growing investment attractiveness of cities and entire regions. In an interview with BRICS Business magazine, he explains how the 2013 Summer Universiade in Kazan helped to solve problems that could have taken another 20 years to tackle. BRICS Business Magazine: From your personal impression, was Tatarstan well known abroad before the Universiade? What changed after it was held? Rustam Minnikhanov: We have been working long and hard to make Kazan and Tatarstan more recognized in the world. This is vital in order to attract investments into the republic, since an investor is interested in knowing as much as possible about the place where they plan to invest their money. Until a few years ago, foreigners knew only two cities in Russia – Moscow and St.Petersburg. However, in the course of our visits abroad, we talked about our republic. We emphasized that Tatarstan is one of the most dynamic regions. I think that with the help of the Universiade we succeeded in this endeavor. About 12,000 participants from 160 countries and numerous guests came to our country. Universiade competitions were broadcast on the leading sports channels. BBM: The world frequently protests against major sports events that are too big a luxury for cities and countries. What were the financial expenses of the Universiade? What is the long-term economic benefit of the Universiade that you are predicting? R.M. : I do not share this point of view. Major sports events, of course, require investments not only in their conduct, but also in the construction of sports facilities and infrastructure. However, after the competition, new sports facilities, roads, road junctions do not go away – they serve the people. Preparations for the event were under way for five years. The work was carried out in the following areas: construction of sports facilities and the Universiade Village; the development of the road network of the city; subway construction; repair of apartment buildings located in areas hosting the 2013 Universiade; riverbank protection works; construction of a new terminal at Kazan International Airport; the realization of ecological concepts and other infrastructure facilities; as well as the modernization of health-care services. After the Universiade, Kazan has qualitatively changed, becoming a much more comfortable place to live. Many questions have been solved, which, without this event, would take about 20 more years to be sorted out. BBM: What would you recommend to Sochi and Rio, cities preparing for their Olympics? The first city is ready to host the Olympics and very little time remains until the beginning of the Games. R.M. : First of all, I would advise not to pay attention to all of the accusations, and work on the organization of the Games. Speaking of our experience, many people did not believe that we would have time to finish all the preparations for the Universiade. However, I did not pay attention to them. It turned out that we managed to build the necessary facilities, prepare and organize this event. I am sure that the organizers of the Sochi Olympic Games and the ones in Rio de Janeiro will be able to implement all the plans on time. We are ready to share our experience in the preparation and organization of such large-scale sports events. BBM: Foreign business is well aware of Tatarstan. What are the main objectives of foreign investors? R.M. : We have many areas for investment. In particular, foreign companies are attracted by the hotel business, especially after the Universiade in Kazan, when many tourists came. In general, we are open to any proposals, and investors can rest assured that any project in Tatarstan will be readily backed by the leadership of the republic. In Tatarstan, we can offer a developed infrastructure and also skilled personnel to hi-tech companies. This interview was conducted before the crash on November 17 of flight 363 from Moscow to Kazan. Irek Minnikhanov, the son of Tatarstan’s president, was among the 50 passengers and crew who died. The RBTH editorial team offers its condolences to relatives of all the victims.